Ruben's style contains a great deal of vivacity that surpassed even the most influential artists of his time. He had a vivid imagination and was successful in transforming the Baroque style into an international art form. Rubens successfully combined the old style of Italian Renaissance with Italian Baroque aesthetics and his works portrayed immense spirit in his depiction of his subject matter. Never before had an artist painted such a diverse range of subject matter. 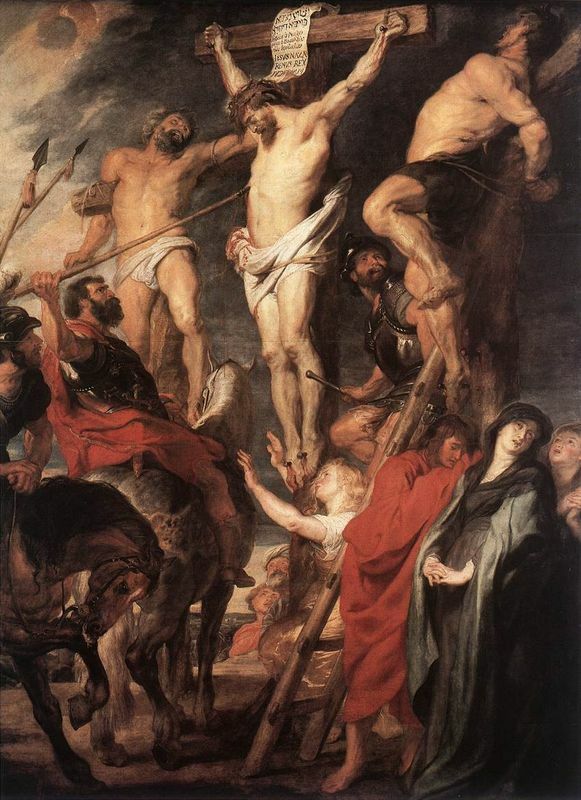 Rubens combined various technical methods and genres and his subject matter consisted of religious figures, historical works, hunting scenes and animals, portraits and landscapes. These works were inspired by the Bible and were largely commissioned by the church or by the artist's wealthy patrons who liked to show their devotion. To create these paintings, Rubens drew on the classic Italian iconographical aspects in elevating the religious subjects in utmost splendor and symbolism. Drawing on his biggest inspiration, Titian, Rubens mainly depicted historical figures from the classical style of ancient Greek and Roman mythological heroes and heroines. He continued to portray them in splendor, stylishly and with aspects of eroticism. 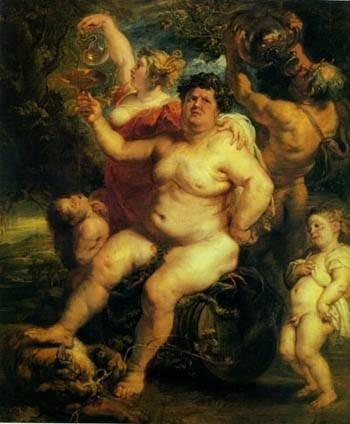 With such paintings, Rubens could be free in his depiction of the human body as he painted many of Greek Gods and Goddesses and characters from Roman mythology. He would frequently present hunting scenes as he played with the concept of physical torture and the ferociousness among the animals and mankind amidst a highly symbolic scene. The artist would add immense detail to the agonized faces of the hunter and hunted that evoked concepts of humanity and beastliness as a metaphor to society's anarchy. 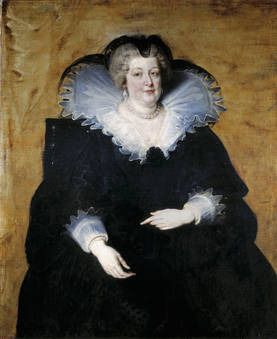 Rubens created many portraits for his royal and aristocratic affiliates, friends and family. He portrayed many of his wealthy and royal subjects in exuberance, befitting their status. 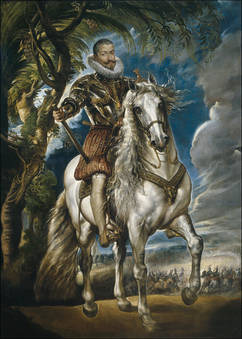 His works were not as formal as the predominant artistic style but Rubens created a rich Baroque style in his portraits that made him popular. Rubens' landscapes were to become one of the major influences for the Romantic period. He painted many of these landscapes after he married with his second wife, Helena. The artist started to appreciate nature on a more intimate level and depicted dramatic scenes as the weather conditions overrode the lands, creating a deep psychological aspect. Rubens aimed to depict the beauty of life in these works as it was in realistic terms but not without the common emotional aspect he wanted his viewers to ponder. For his drawings he would use trois crayons - colored chalks in pale browns, whites, blues, blacks and reds, the latter of which were used for flesh tones and flushed faces. 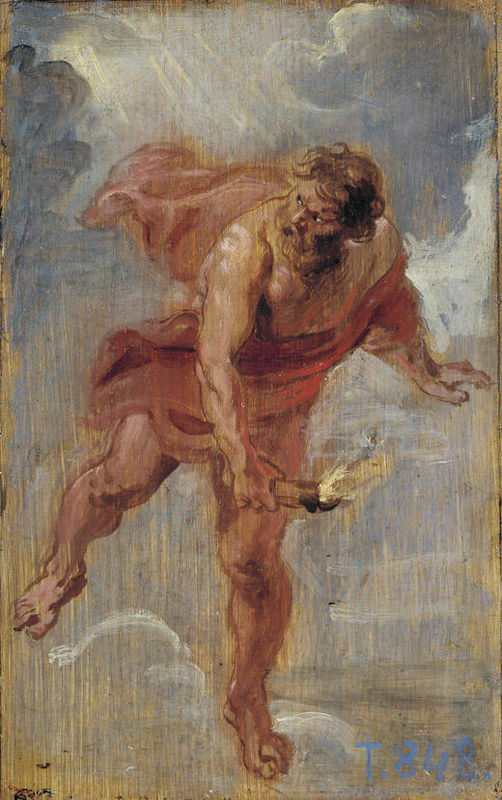 Sometimes Rubens would draw or sketch in brown inks on a grisaille paper. 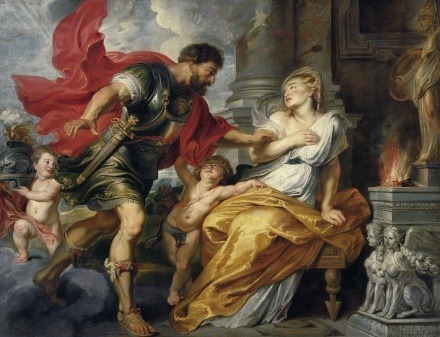 Rubens is known for his bold, swift strokes that eluded his passion and vigor as he painted and conveyed the drama of each scene. However, he did not neglect more intricate details in his various objects and subjects. Fond of painting scenes where there were numerous people, Rubens' works often had an overflowing effect. He would include various other elements to add effect, such as nimbus clouds and his landscapes in particular draw on the Flemish tradition of painting in great detail. Regarding his portraits, Rubens used an array of impastos to create clear, smooth, almost plastic-like surfaces. He achieved this by using fine impasto colors to produce a more sensitive image which portrayed the subject as realistically as possible. For his lighting tones, he would create a dark background either in the bottom or top, depending where the subject matter was positioned. There would always be a lightened bottom or top to ensure balance and the subject was brightly painted in highlighted tones to direct the viewer's eye. 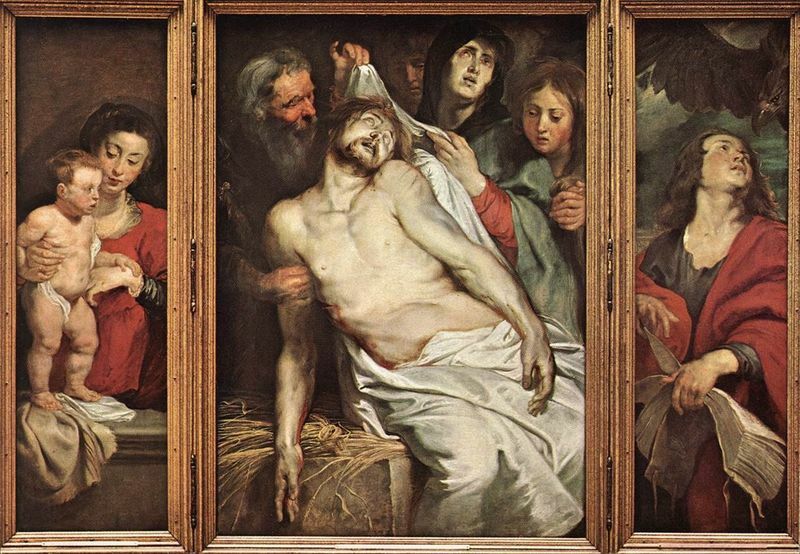 Rubens would use a large amount of grays, blues, greens and a variety of flesh tones. He frequently incorporated deep and luscious reds and golds in exuberance. Various undertones were used to add depth, define light and recreate textures as realistically as possible. Rubens extended his colors for the flesh tones and devised new ways of creating tones to accentuate his subject in various lights. He also did this to depict the character of the subject by emphasizing their femininity or masculinity. The artist used white as an undercoat to bring out the top layers and brighten up the image. He would also use greens and blues richly as he painted water and trees in all of his genres. 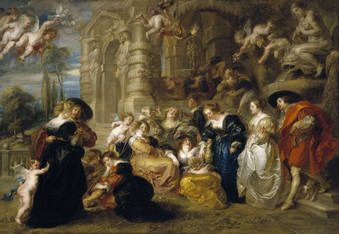 Rubens did not limit his color palette and was skilled at mixing colors to obtain the right tones as he envisaged them. He used an abundance of color, believing this would dramatize the image further and also painted thickly upon the canvas in various layers to make the image more prominent. Rubens' compositions are best described as powerful and forceful, with the viewer being faced with overwhelming displays of emotion. His inclusion of different subject matter and abundance of people helped create a three-dimensional effect where the subjects would assist in creating a focus point. They were aesthetically pleasing and were rich in content and provided plenty of symbolism. Their postures and positions, along with various other elements, created a natural flow in his paintings. Sometimes Rubens used a pyramid structure in his canvasses such as angels and individuals looking upon a holy figure. This pyramid technique served to draw the viewer into the painting as they are forced to take in all of the events and narratives within the canvas and, in a sense, feel the emotions being portrayed. 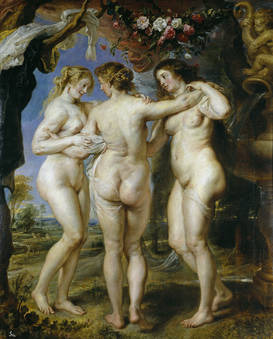 Rubens created various compositional techniques to ensure focus in his work and he used his color palette extensively to divide his painting by introducing three different tones. Each was divided into black and white with the main figures in highlighted tones on top of the composition to accentuate their central status.